The Navajo Indians who worked at the Harry Carey Ranch staged riding demonstrations (among other things) for the tourists. 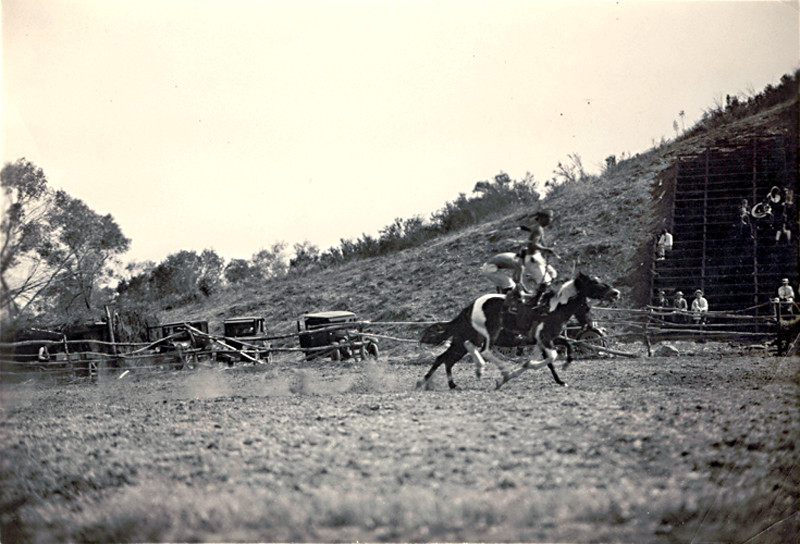 Here, two Navajo men ride across the grounds while standing atop their horses. It might be noted that this isn't Roman riding — which the performers did do. In Roman riding, one person stands on two horses at the same time. Here, each man is standing atop one horse. Harry Carey Jr. (Dobe) and his pal Ben Johnson did some Roman riding in 1950's "Rio Grande" with John Wayne, but no, Dobe said he didn't learn it from the Navajos at the ranch. Dobe wasn't yet 7 when the Indians left in 1928, shortly before the St. Francis Dam broke. DC2605a: 9600 dpi jpeg from original print courtesy of Harry Carey Jr.